Years ago, decades ago, a very little thing changed my life. Sometimes it's worth going back and thinking about this kind of thing. Small, hardly noticeable, seemingly insignificant events, images, conversations, dreams, words, [fill in the blank] that mark a fork in the road that you didn't even realize you were taking. As it happened, I went on a retreat. I’m not really a group-retreat-type person, but for some reason I wanted to go because I had this feeling it would change my life. I can't explain the feeling, but it was there, like a little whisper inside. So I went, but when the weekend was over, I was disappointed. I thought back over all the speakers had said, and it was all good, but for me, not life-changing. No life-changing blast from any direction. What had I been thinking; what had I expected? I felt silly for expecting anything. And so life went on. Time passed, lots and lots of time, years, and from a distance I finally saw the thing that had changed, and why that one thing had in turn changed my life. My roommate at the retreat, a random placement, someone I hadn't known, journaled. I didn't, but after observing her writing regularly in her notebook, I tried it too that weekend. And there it was. The start of a writing practice that would take me on a path I hadn't imagined. I wonder how guidance really works, how many chances we get, what combination of love and grace and knowledge of the inner way of a person is rolled into these kinds of subtle, divine nudges. I don't want to miss a single nudge but fear that I do. The last couple weeks I had reason to shop for a new dress. I had an idea what I wanted: a wardrobe staple, nothing fancy but a little classy, neutral color, something that would last more than a year or two. I had this list of criteria in my head, but since reading Overdressed: The Shockingly High Cost of Cheap Fashiona couple months ago, I also had another list in my head. 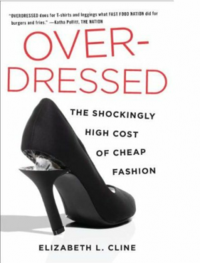 In Overdressed, author Elizabeth L. Cline surveys the clothing industry and what she finds make you think twice about picking up the latest fashion steal at the nearby mall or discount store. Her premise is that our growing desire for more and more clothes and our unwillingness to pay a reasonable price for them or to keep them for more than a season is driving the industry to produce ever greater volumes of ever cheaper clothes with ever poorer wages to the sewers. And Cline is very clear, there are actual sewers (as in sew-ers), real people, in this chain of production who need their wages to live and raise families. Her key suggestions include to shop for labels known to pay their sewers living wages and provide good work conditions, and to buy less, investing in pieces that will last for a long time. Cost of course is a stumbling block there. Manufacturers who pay living wages are more likely to make expensive clothes (comparatively speaking). She suggests buying better clothes but on sale or at consignment or thrift stores, and to forego the multitude of cheap pieces in lieu of one or two that will last. She suggests learning to sew or at least learning to alter your clothes (or hire someone) so that they fit well or so that you can update them to last longer. Check out Cline’s website for more suggestions and resources. I found a dress, one that should last and that was marked way down at end-of-season clearance. At its original price I would have had to pass it by. For those of you who know me, you’ll probably see me in it for years to come. There’s a great little sewing store not from where I live, Sewtropolis. When it first opened, I met the owner, Nikol, and asked her about why she went into business. To help reintroduce people to the lost art of sewing, she said. Her business is doing well, now in a bigger and better location from its original site. Sewtropolis has a fun blog, unique fabrics, sewing machines onsite for your use, and tons of classes that let you walk away with a finished garment. One of my intentions for this year is to sew more. Sewing anything would be sewing more. So far, I’ve bought a pattern. But the year is still young. The last time I sewed anything was a couple summers ago. I had taken the week off work to make progress on my manuscript. After scratching and scribbling for a couple days and to no great effect, I realized what I really needed was to be quiet for a while, to stop the flow of words, and so I sewed a sundress. The last time before that was probably a maternity dress (and my sons are now in their twenties). Lent started last Wednesday. I try to mark it with a practice, although I often fail to be consistent. A few years ago during Lent I listened to and prayed along with the Pray-As-You-Go Jesuit devotional, which I’ve written about before on this blog. Every day I wrote some notes or reflection in response to the devotional on an index card. It turned out to be a good thing. I liked flipping through the cards to review what I’d been thinking about, and even now I like that those cards are held tight with a binder clip. This year I’m again listening to the Jesuits, but this time I’m trying to write a small poem in response to the daily reading. Writing a poem is a good way to break routine linear thinking and enter into a prayer or text in a new way, particularly if it’s a text, or reading, you’ve heard multiple times before. Let me be the first to say, these are not good poems, but they will help me think in new ways and be markers of something. I’ve been reading Early Morning, Kim Stafford’s biography of his father, William Stafford, one of America’s greatest and most prolific contemporary poets. Stafford published more than 60 books via his practice of getting up every morning long before dawn, making himself a piece of toast and cup of instant coffee, and laying down on the couch with a sheet of paper, getting up only when his daily poem was written. When asked how he could write a poem every day, he answered that it was only by lowering his standards. I’m adopting that stance also in this daily practice--the goal not being to produce anything of literary value but to let the Word produce something in me. A review in the Onion pointed me to Punching In: One Man's Undercover Adventures on the Front Lines of America's Best-Known Companies by Alex Frankel, although the review wasn’t complementary, giving it only a C+. I give it an A-. Frankel is on a mission to explore the culture of workplaces and how new front-line employees are indoctrinated and made to manifest that culture, particularly in the short time allotted by the typical training period. Like Ehrenreich in her well-known Nickle and Dimed Frankel goes native, posing as a grad student and taking a false name. Unlike Ehrenreich, Frankel’s mission feels more gentle, to explore rather than expose, although to be fair, the stakes were higher for Ehrenreich, linking her daily survival to her ability to find and keep a job as she did. Frankel got hired at UPS, Starbucks, Gap, Enterprise, and Apple Store. He also tried but failed to get hired at The Container Store and Whole Foods. Halfway through the journey, I came across a statement that captured the spirit of the project quite well. In the formative years of UPS, its founder, James Casey, was known to repeat a basic phrase: 'Anybody can deliver packages.' It was both modest and profound, with clear implications: Anybody can deliver packages, so we had better be the best at it…It's the same sentiment, really, at any leading company. Anybody can pour a cup of coffee, rent out cars, sell pairs of jeans. Except, of course, they can't. The places, it seemed to me, that are the best at these things take 'anybodies' off the street and make them their own 'somebodies.' This completely intangible transformation of individuals is something increasingly critical to the success of companies. By organizing and running a small, yearlong experiment with myself as the subject, I would see and feel this transition in process. The journey would be this: I would walk in as an anybody and depart as a somebody. Or at least that was the idea. I thought back to my early part-time jobs and wished I’d been more attentive to the forces behind the training and the philosophy of the places where I worked. Read this and you’ll look at the man or woman handing you a latte or folding jeans behind you at Gap with some empathy and even admiration. As with everything in life, there is so much more going on than we can see on the surface. Thanks for reading and enjoy your weekend! If you want, share with me what you’re doing for Lent, or if you've found a bargain on a garment that will last forever or made anything fun lately or are on your way to becoming a somebody at your job. Last night I went to a high school graduation party for a lovely young woman who had been in a Wednesday night children’s program at the small church we both used to attend. I was the “leader” for that group of girls, fourth grade or so to sixth. I loved those girls. While she was still in my group, the church imploded. The grief was great and sent us in many directions. If I could do it over I would have stayed in better touch. Last night, there she was, nearly grown up. Deep in the archives of this blog, there is a post I wrote at that time about helping the girls make a journal of their own by covering an old-fashioned composition book with their choice of scrapbook paper and decorating it with ribbons, stickers, beads, or whatever they liked. I thought of this last night when I saw her. This morning, a coincidence struck me. Last month I had discovered a stack of unused composition books that were left over from that time, and so I covered one with decorative paper and have been using it since as a writing notebook. In fact, the coincidence came to me after I wrote the above two paragraphs in that very notebook. I like to think that coincidences are signs of something big moving under the surface, some unifying cords of meaning that we are to attend to, follow, ponder, grab hold of. I like to think that our time together in that group, even as we cut paper and glued ribbons, even though the separation that followed was too long and wide and a matter of regret, planted seeds of attentiveness and faith. I’m going to pray that the lovely high school graduate never stops paying attention to her life, never stops cultivating it with great care, never stops inviting God to help her write her future.